Gordon Zola is a minifigure released in 2014 as part of the LEGO Movie theme. This is a description taken from LEGO.com. Please do not modify it. 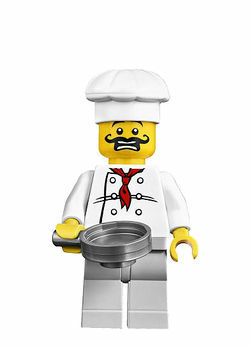 (visit this item's product page) The head chef of the ritziest restaurant in all of Bricksburg. His recipe book contains precise instructions for preparing everything from giant turkey legs to pizza pies, which is easy when everything is made of plastic and the ovens don’t turn on. Chef Gordon Zola secretly dreams of a day when he will be able to experiment with creating his own new and original dishes, but as long as President Business is in charge, he knows that he has to keep making everything according to the rules. The head chef of the ritziest restaurant in all of Bricksburg. His recipe book contains precise instructions for preparing everything from giant turkey legs to pizza pies, which is easy when everything is made of plastic and the ovens don’t turn on. Chef Gordon Zola secretly dreams of a day when he will be able to experiment with creating his own new and original dishes, but as long as President Business is in charge, he knows that he has to keep making everything according to the rules.